This weekend will see the the top four European Basketball teams arrive in London ready to battle it out in one of the biggest Basketball competitions in the world – The Euroleage Final Four. 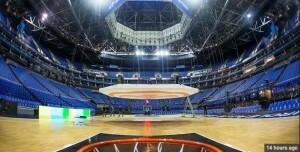 The special 2 day event will be hosted in the famous London O2 Arena over this Friday (10/05/13) and Sunday (12/05/13) and will be broadcast to millions of Basketball Fans from all over the world. Over the 2 day special event basketball fans will be treated to 4 fantastic games of exciting basketball between CSKA Moscow, FC Barcelona Regal, Olympiacos Piraeus and Real Madrid. Each of these teams will take part in a Semi Final on Friday night and then the losers of each semi final will play in a 3rd and 4th place play off on Sunday and then the Final will follow on Sunday night. With such a prestigious trophy at stake, it is no wonder the tickets for this event have become extremely hard to get hold of. So for any Basketball fans that are in London over this special weekend of entertaining basketball who can’t get to the O2 Arena to watch the games Live, there will be an official Euroleague Fan Zone in London’s famous Trafalgar Square which will allow basketball fans from all sets of teams to enjoy a great party atmosphere and watch the games on the big screen in one of London’s historical areas. This will surely create a fantastic atmosphere for everyone in the area and will attract thousands of visitor to the already popular Trafalgar Square in London. If you are thinking about travelling to London and want to check out the great Euroleague Basketball atmosphere in the City then why not check out the MyLiveStreams Euroleague Fanzone Trafalgar Square Webcam. Watch thousands of Basketball Fans from all over Europe arrive and party in the great Eruoleague Fan Zone Webcam. Check out all of the Euroleague Final Four Basketball action Live on Webcam thanks to our great Trafalgar Square Webcam. The amazing Euroleague Fan Zone is expected to cover over 2000 square meters of Trafalgar Square and will have to roofed basketball courts in the middle. There will be a full list of entertainment going on throughout the weekend and fans can enjoy live music and appearances from famous Basketball legends. There will also be a great Sports bar so fans can enjoy a cool refreshment while soaking up the atmosphere. 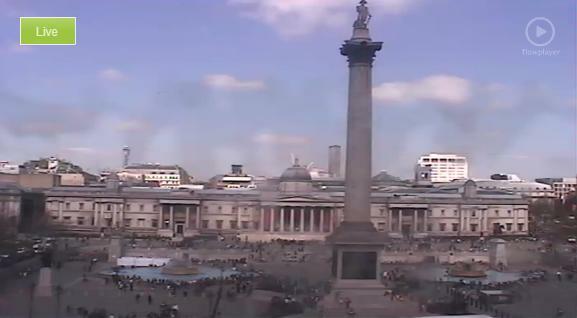 Watch all of this Live on Webcam with the London Trafalgar Square Webcam on MyLiveStreams. Enjoy Live Streaming Views of the Official Euroleague Final Four Fan Zone with our great Live Streaming Trafalgar Square Webcam. Enjoy Live Euroleague Basketball Webcam Views and much more thanks to the MyLiveStreams Live Webcam Streaming Network. check out our great Live Streaming Cams now.